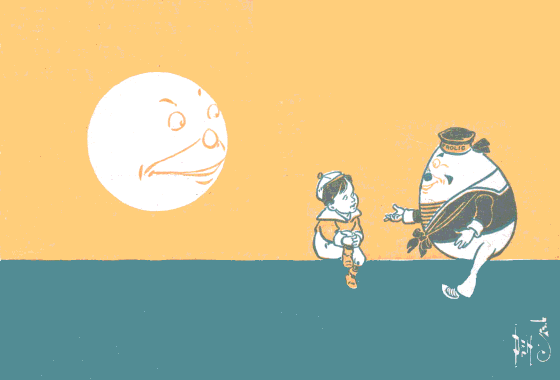 UMPTY-DUMPTY was a smooth, round little chap, with a winning smile, and a great golden heart in his broad breast. 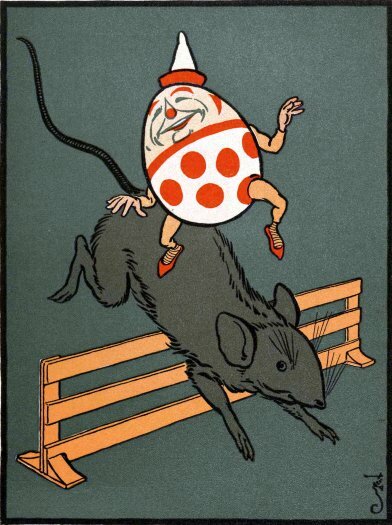 Only one thing troubled Humpty, and that was, that he might fall and crack his thin, white skin; he wished to be hard, all the way through, for he felt his heart wabble when he walked, or ran about, so off he went to the Black Hen for advice. 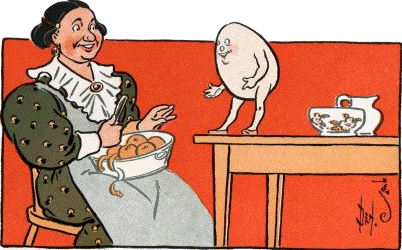 This Hen was kind and wise, so she was just the one, for him to go to with his trouble. 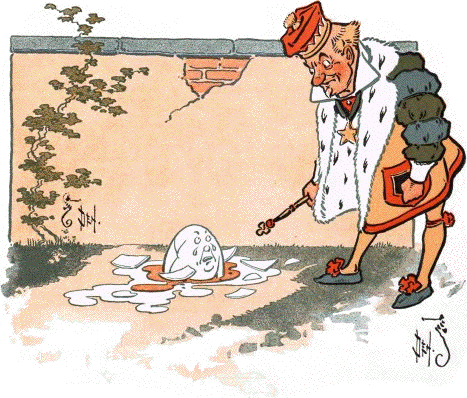 “So you see, he came to a very bad end, just because he was reckless, and would not take a hint from any one, he was much worse than a scrambled egg; the king, his horses and his men, did all they could for him, but his case was hopeless,” and the Hen shook her head sadly. 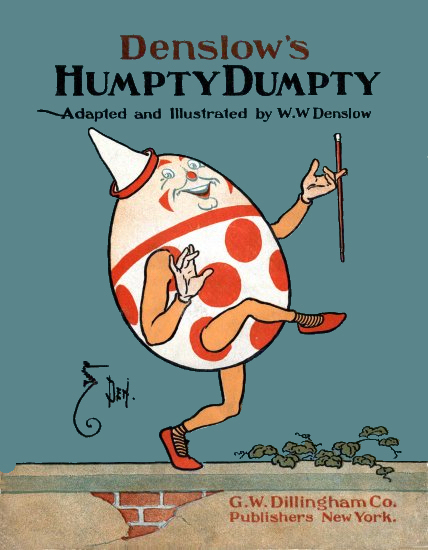 So Humpty rolled in next door, and told the Farmer’s Wife that he wanted to be put into boiling hot water as he was too brittle to be of any use to himself or to any one else. 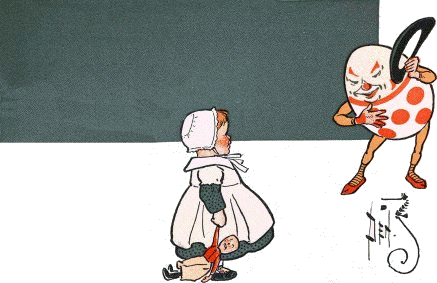 So she tied him up in a gay new rag, and dropped him into the copper kettle of boiling water that was on the hearth. 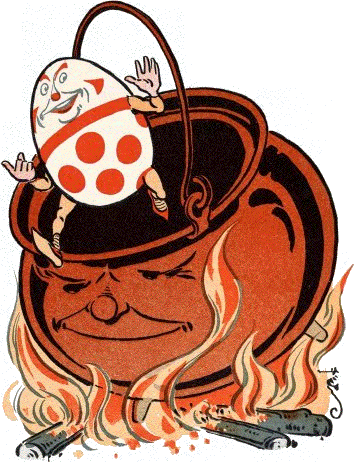 It was pretty hot for Humpty at first, but he soon got used to it, and was happy, for he felt himself getting harder every minute. 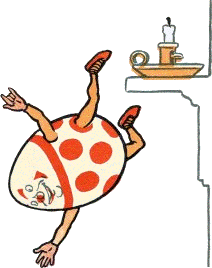 He did not have to stay in the water long, before he was quite well done, and as hard as a brick all the way through; so, untying the rag, he jumped out of the kettle as tough and as bright as any hard boiled Egg. 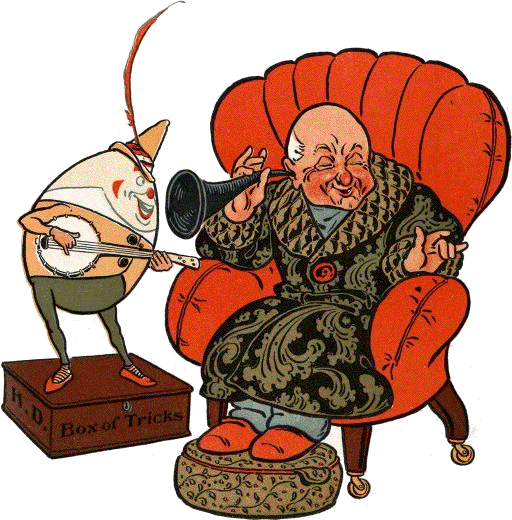 The calico had marked him from head to foot with big, bright, red spots, he was as gaudy as a circus clown, and as nimble and merry as one. 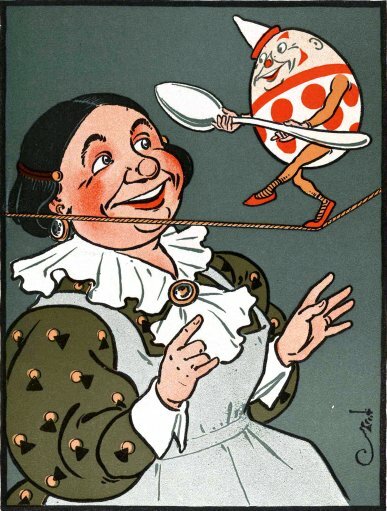 The Farmer’s Wife shook with laughter to see the pranks of the little fellow, for he frolicked and frisked about from table to chair, and mantelpiece; he would fall from the shelf to the floor, just to show how hard he was; and after thanking the good woman most politely, for the service she had done him, he walked out into the sunshine, on the clothes-line, like a rope dancer, to see the wide, wide world. 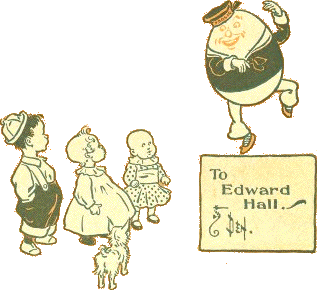 Of the travels of Humpty-Dumpty much could be said; he went East, West, North and South; he sailed the seas, he walked and rode on the land through all the Countries of the Earth, and all his life long he was happy and content. he twanged the strings of his banjo and sung a merry song, and so on through all his travels, he would lighten the cares of others, and make them forget their sorrows, and fill every heart with joy. But wherever he went, in sunshine or in rain, he never forgot to sing the praises of the wise Black Hen nor the good, kind Farmer’s Wife, who had started him in life, hardened against sorrow, with a big heart in the right place, for the cheer and comfort of OTHERS.